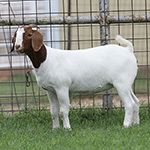 Comments: We start the sale with a very precocious January born doe. She has that square hip that 48 Special passes on to all his offspring. 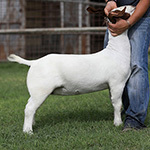 48 Special is an own son of JR and he sired one of the high selling does at the Premier sale in Indianapolis this March. 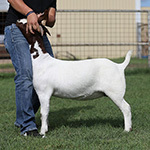 This doe is super clean fronted, level down her topline, and square on all 4 corners. Notes: Delivery options are available. Please contact the seller for delivery arrangements. All transportation costs are at the buyers expense. 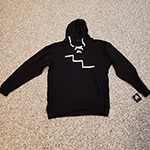 Please contact the seller to arrange pick up or delivery. Comments: Another extremely big hipped, barrel ribbed, stout made doe. These kinds are hard to make and hard to find. This one should be in a flush program. With 6 shots of 900 in her pedigree you know she�s tight hided and she�s going to be a producer. Comments: This doe is big boned and big footed for her size. She has that tucked up chest floor that everyone is looking for and that tubular shape. JR does make good females. Comments: Of course, the first thing you notice about this doe is her color but when you really study her she is super long sided. She is big enough to breed now, up fronted, and up off the ground. Comments: This impressively thick made doe kid is by a buck we call 50K. 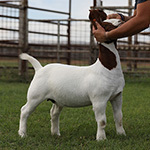 He is by 706 Bean (Douglas Bean) a double bred 612 Bean buck that sold for 25,000 and he�s out of a Top Hand doe and Top Hand sold for 30,000 thousand so we figured his pedigree was worth at least 50K. This doe herself has a huge forearm and she is built like a tank, but she still has enough eye appeal to catch your attention when you walk in the pen. Brood doe deluxe here!! 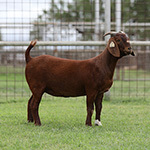 Comments: The sire and dam of this doe kid both happen to be full bloods. 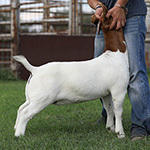 The doe is by Who�s Who and Almost Perfect 10 was a flush mate brother to a Norman Kohl�s buck named Surprise Surprise. 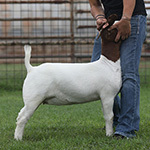 Both these bucks made their mark in the show ring and as herd sires. The NK 10 does crossed extremely well with the 900 bloodline. Comments: With tree trunks for legs and muscle to spare this doe should work in everyone�s wether program. She�s got a rib cage shaped like a barrel and her neck sits straight over the top of her shoulders, you can�t make one any cleaner fronted than this gal. Comments: If you like �em thick then lot 8 is the one for you. She gives new meaning to the phrase doublewide. And yet she still has a pretty front end and a tucked up chest floor. 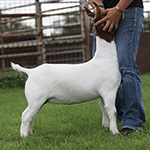 If your goats need a little junk in the trunk don�t let this one get away. Comments: This spring we got a call from Steve Wiseman saying he was working too many hours away from home and now that his dad had passed away, he didn�t think he could kid out his does like he should and he needed to sell them. This little does� momma was in that group. And I think this doe kid has one of the biggest backs I�ve ever seen on a doe kid. Her top is huge, she is stout!